Okay, Valentines…you’ve only got a couple of days to pull yourselves together. I have the perfect little cake to save the day! I know, I know…flourless chocolate cake is sometimes better known as flavorless chocolate cake but that is definitely not the case here. Don’t let the size fool you. 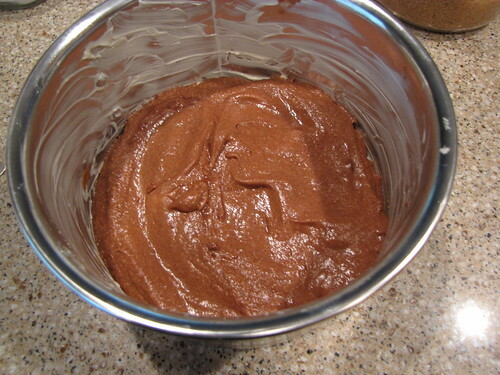 This little guy is intense…a little bit like those rich chocolate soufflé cakes but without the runny center. 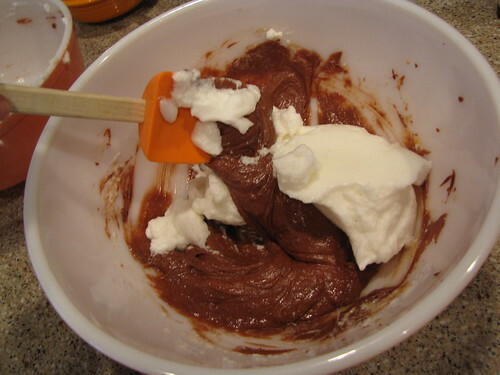 This recipe is great in so many ways…BIG chocolate flavor, very little work, and CUTE! Eggs, Semi-Sweet or Bittersweet* Chocolate Chips, Butter, Brown Sugar, Cinnamon, Salt, and Vanilla. 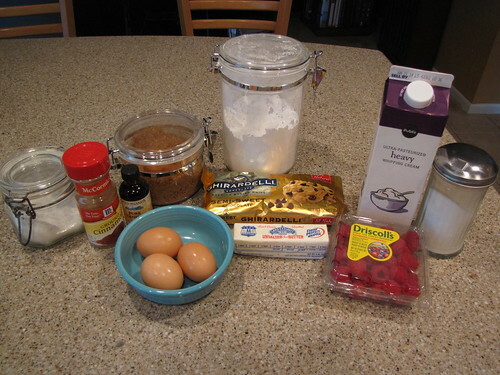 Also Powdered Sugar & Raspberries for topping with the options of whipped cream or vanilla ice cream (not pictured). 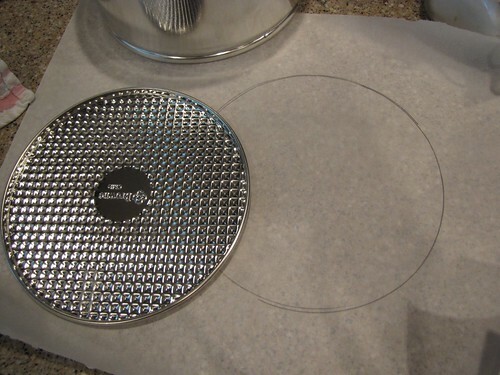 Because this is a small cake, you will need a small 6-inch or 7-inch pan. The recipe calls for a springform pan like you would use to make cheesecake. 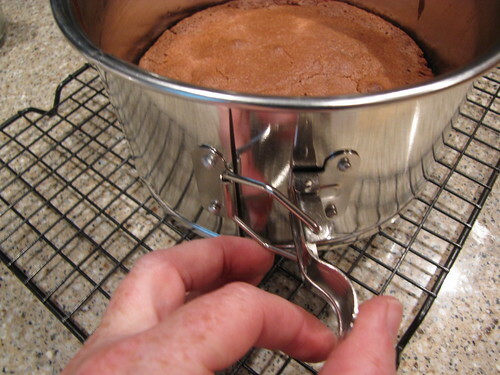 I think you could also use a small regular cake pan (without the spring) but I haven’t tried that yet. 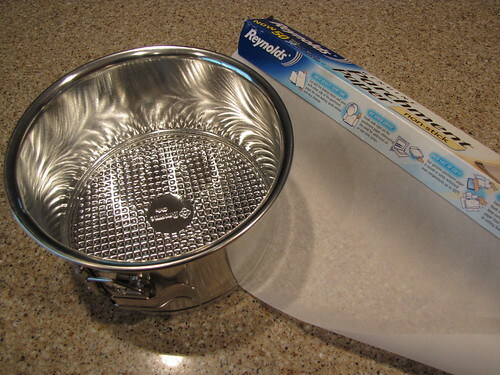 You will also need parchment paper. I’m not a huge fan of having to go out and buy some special pan or piece of cooking equipment for only one recipe, but trust me when I tell you that you will be making this cake again and again. Go ahead and buy the little pan. Plus, I’m thinking tiny cakes can be the new craze like cupcakes and macarons. Open the spring and remove the bottom from the pan. Trace the outline of the bottom on a piece of parchment and cut out a circle. Reassemble the pan, place the parchment circle in the bottom, and butter the sides and top of the parchment circle like crazy. I like to take 1-2 Tablespoons of butter and zap it in the microwave for about 5-6 seconds so it gets just a little bit soft. Then you can get a nice good coating of butter all over the pan. 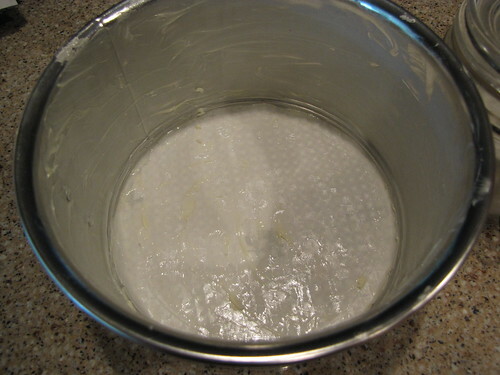 If you are using a regular, non-spring pan, butter yours especially well so the cake doesn’t stick. 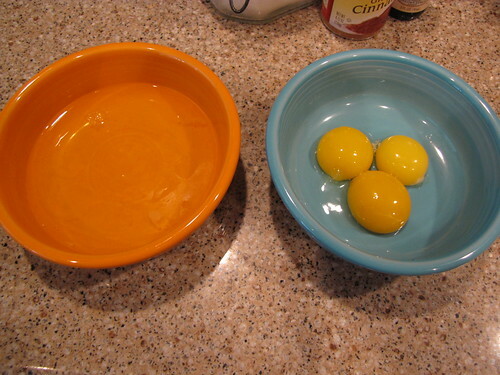 Separate 3 eggs – whites in one dish and yolks in another. I just use my hands to separate the egg – crack the egg into one hand and let the white slip through your fingers. You can also use the old tried and true method of tipping the yolk back and forth between the halves of the eggshell. 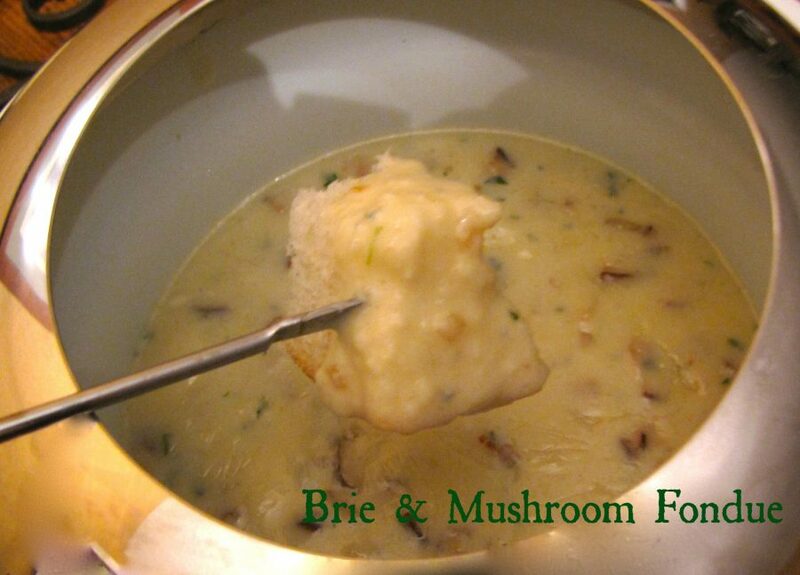 Melt 6 Tablespoons (that’s ¾ of a stick) of butter in a medium saucepan over medium heat. 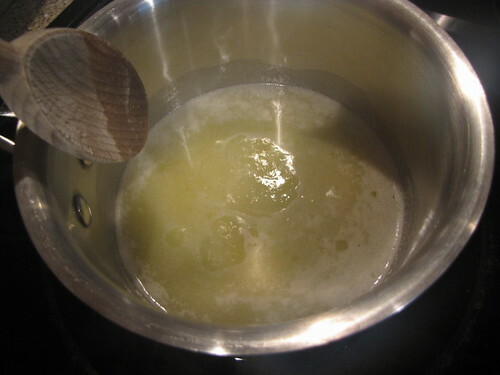 Once all the butter melts keep stirring for just a few minutes more so that the water that is in the butter can cook off. 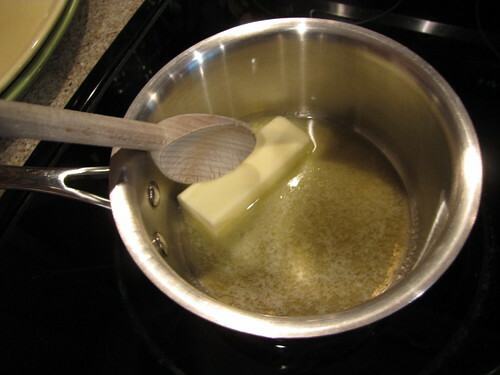 The melted butter will sit there doing nothing and then all of a sudden, the middle will bubble up, hiss and spit. That’s the water evaporating. 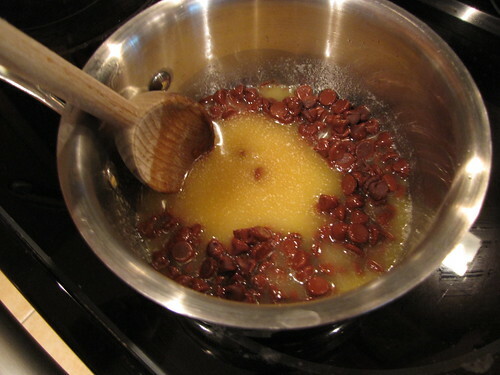 When that happens, quickly remove the pan from the heat and stir in 4 ounces (about a heaping ½ cup) of chocolate chips. 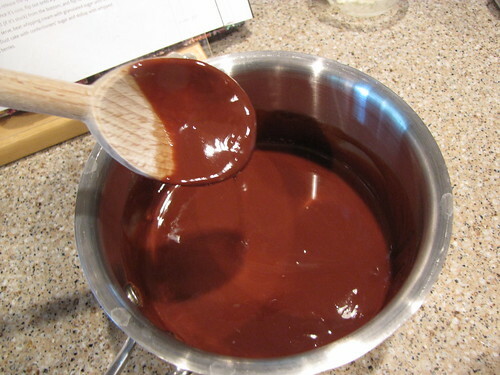 Stir the chocolate off the heat until it is melted and smooth. *Note: the original recipe calls for semi-sweet chocolate but I think this would be even better with bittersweet chocolate. That’s what I’m planning to try next time. Leave the chocolate off the heat to cool. Give it a stir occasionally to keep it glossy and for quicker cooling. 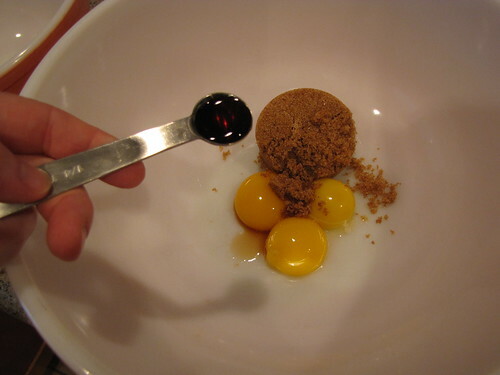 Meanwhile, in a large bowl, combine the 3 egg yolks, 1/3 cup lightly packed brown sugar, ¼ teaspoon vanilla, and a pinch of cinnamon. 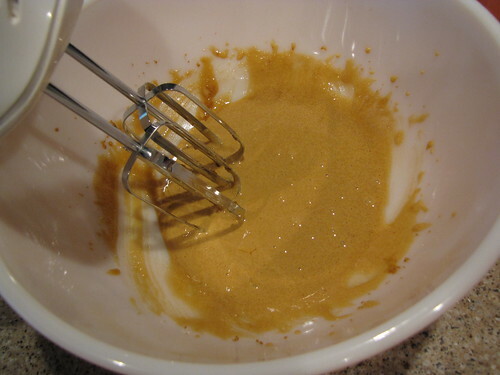 Use a whisk (I will use a whisk next time…more on that later) or electric mixer to combine the ingredients until they are smooth and slightly thick. 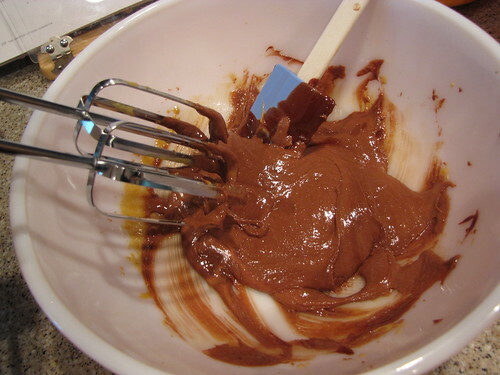 Slowly add the lukewarm chocolate and mix (again, you can use a whisk) to combine. 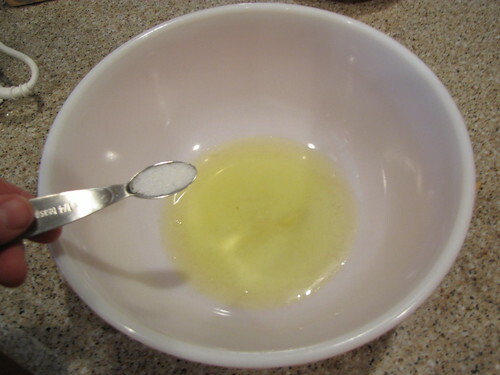 In a separate clean bowl, add the 3 egg whites and ¼ teaspoon salt. 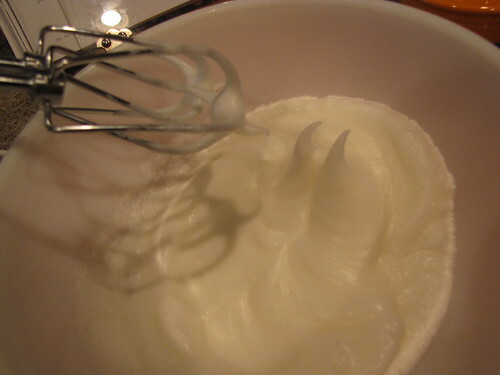 Use your electric mixer (with clean beaters) on high speed to whip the egg whites until stiff peaks form. And after a few minutes more on high speed, you have fluffy egg whites with little stiff peaks when you pull up the beaters. The trick to easy egg whites is a clean bowl and clean beaters. 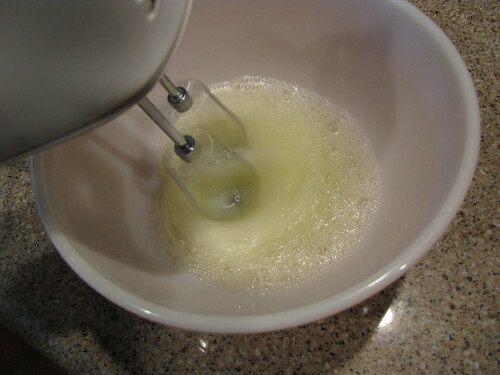 If there is anything slightly oily in there, the egg whites will not whip up correctly. 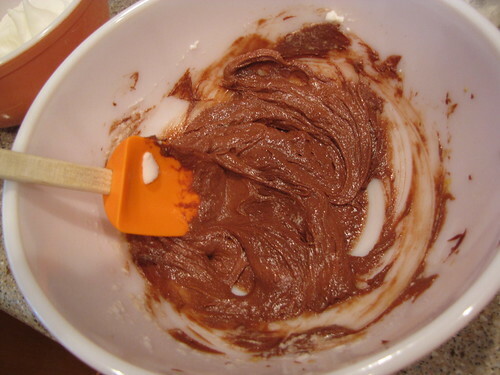 That’s why I would just use a whisk for the early part of the recipe. 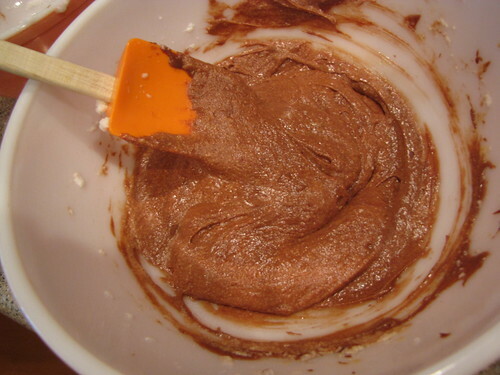 Spoon out 1/3 of the egg whites and stir them into the chocolate mixture to lighten it up. You can really get in there and stir for this step. 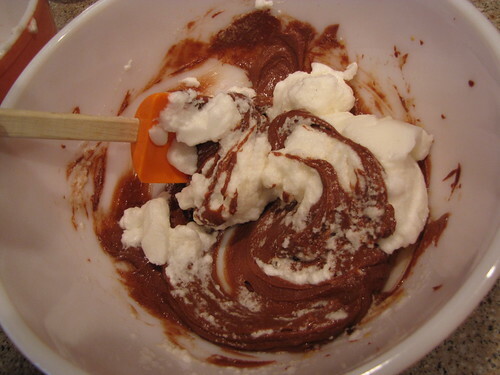 The idea is to thoroughly combine the egg whites and the chocolate. Then add the remaining 2/3 of the egg whites to the bowl but NOW be very gentle and fold them into the chocolate working to keep the egg whites as puffy and inflated as possible. “Folding” in egg whites means that you take your spatula and work slowly and gently in an over/under motion. Turn the bowl a quarter turn with each stroke for best results. Only mix until the egg whites are just incorporated. If you still see a few globs, that’s okay. 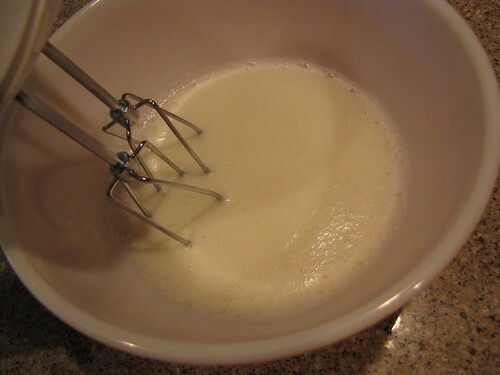 Very gently pour or spoon the batter into your buttered pan. Bake at 350 degrees for 20-25 minutes until slightly puffed up and a toothpick inserted into the center comes out clean. I’ll warn you, like a soufflé, this cake deflates pretty quickly so don’t be disappointed. Think of it as all the chocolate flavor coming together. 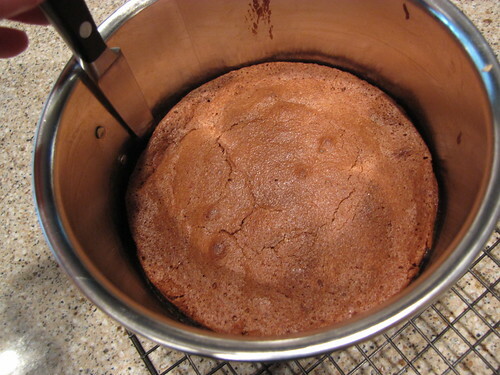 Let the cake cool on a rack for 10 minutes then gently run a sharp knife around the edge of the pan. You can see that my cake had already started pulling away from the pan on its own. That’s the reward for a thoroughly buttered cake pan. Unlock the little spring and remove the outer ring. Let the cake cool the rest of the way just on the base of the pan. When you are ready to serve, place a plate on top of the cake and turn it over to remove the base and peel off the parchment paper. 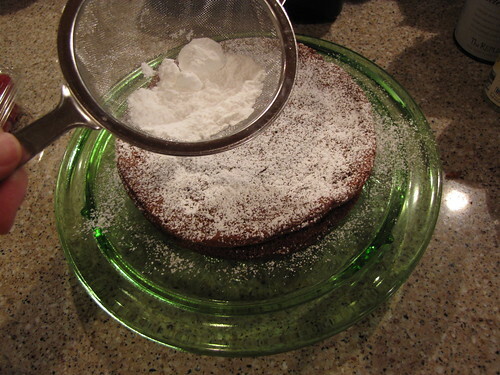 Gently flip the cake back over onto another plate or a cake plate so it is right side up once again. 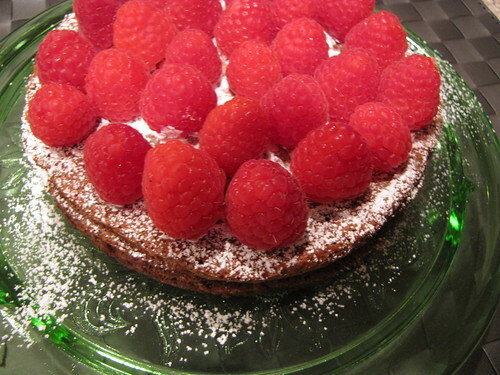 Dust the top of the cake with a little powdered sugar..
and then decorate it with fresh raspberries. 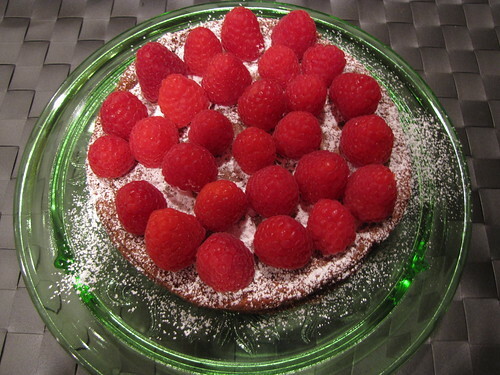 The raspberries not only make it pretty, but take the flavor totally over the top! Serve this with some freshly whipped cream (about 1/2 cup of whipping cream beaten with 1 Tablespoon of sugar for sweetness) or vanilla ice cream. 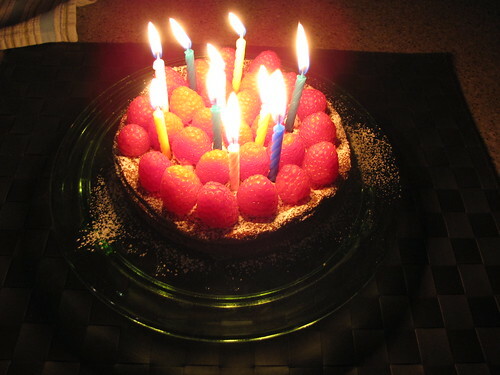 You can even stick some candles in there and have the world’s quickest, cutest, little birthday cake! I’m not sure what we’re having for Valentine’s Day dinner around here but I am sure that this cake is making its second appearance for dessert. 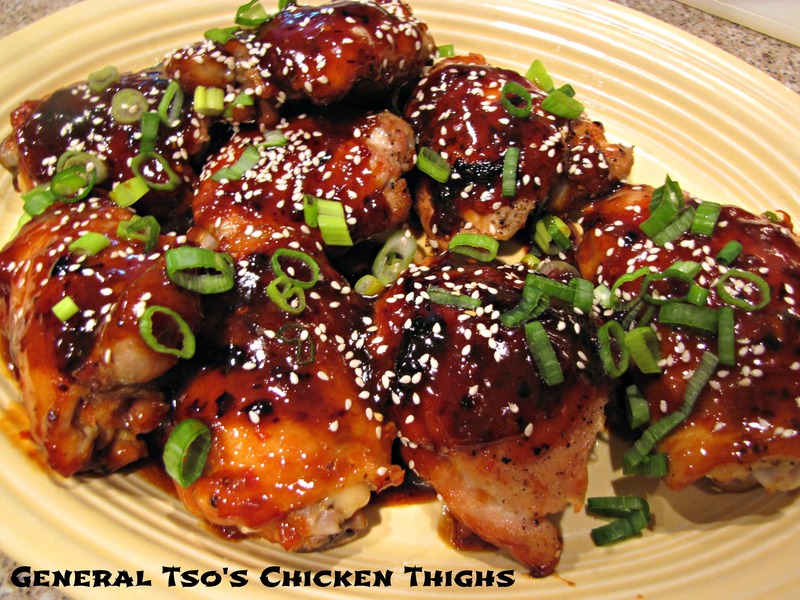 The original recipe (Smitten Kitchen) said this serves 6 but who are we kidding? This cute little cake will make 4 people very happy. 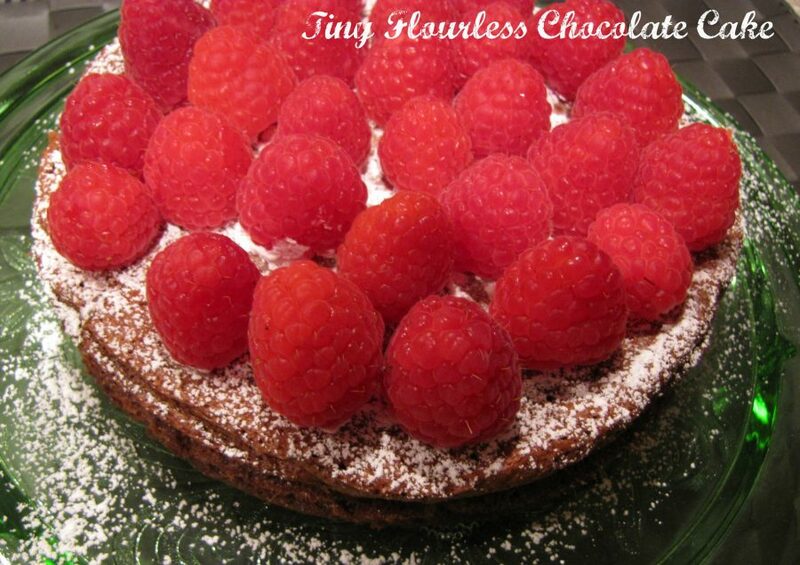 Make a Tiny Flourless Chocolate Cake for someone you love! 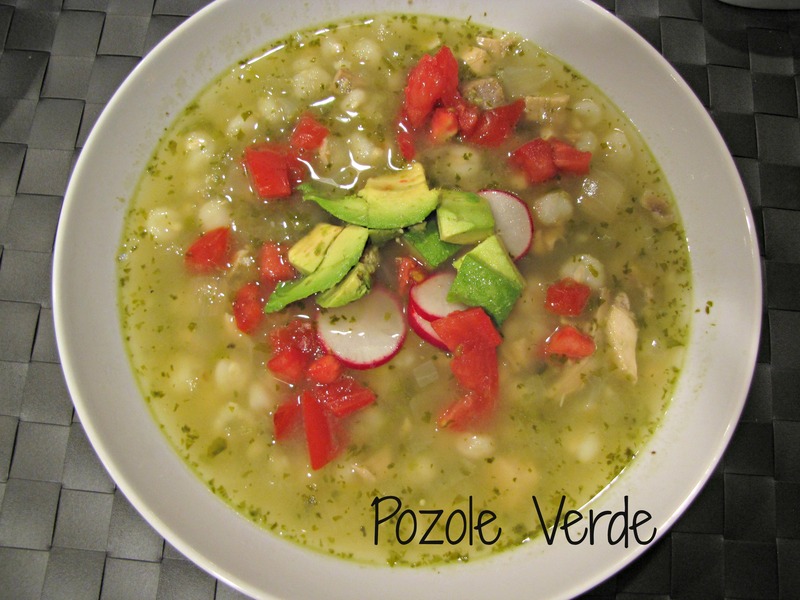 pffft…impossibly deadly and delish!!!!!!!!!! HO BOY! I can be one of your 4……..
Four people? I’m thinking 2! I had a flourless chocolate cake about 12 years ago at a Disney resort restaurant……and I still think about it. IT was so freaking good!! !